In addition to the old feature in MagicPicker where you could copy HEX value of the color to the clipboard, with MagicPicker 5 you can also copy full color name or RGB/HSL/CMYK/RYB/YCbCr/YUV/XYZ values of the current color. Open color spaces and then click the small “copy” button. That’s it! Current values of the current color space will automagically get into your computer’s clipboard. MagicPicker 5.0 is here! Colorize Vector Shapes & Text, color name on the color wheel in Adobe Photoshop and Illustrator, more! MagicPicker 5.0! Colorize Vector Shapes & Text, new features! NEW! Colorize Shapes and Text in Photoshop (activated from menu). * Colorize individual shapes with color feedback. * Control hue of groups of shapes – shift hue and color temperature. * Works with Tone Lock and K-Lock. NEW! New color spaces and color values on the corner of the wheel. Performance improved, 2X faster in many scenarios – when scaling etc. RGB/HSB rulers now can be scaled even more! Author AnastasiyPosted on June 29, 2016 June 29, 2016 Categories MagicPicker, News, UpdatesTags CC, cc2014, CC2015, CMYK, Color names, color wheel, CS3, CS4, CS5, CS6, Extension, Fill, HSB, HTML, Illustrator, MagicPicker, panel, photoshop, RGB, Shapes, Stroke, Text, Update, Upgrade, X11, XYZ, YCbCr, YUVLeave a comment on MagicPicker 5.0 is here! Colorize Vector Shapes & Text, color name on the color wheel in Adobe Photoshop and Illustrator, more! Keep colors bright or dark when rotating Hue° while saving low level of K ink of CMYK – all at once! That lets you find colors on the color wheel within the same dynamic gamut range that look bright when printed! To do that switch on both Tone Lock and K-Lock in MagicPicker – they work together very well! Then rotate Hue° on the color wheel and you will see how MagicPicker adjusts the color so it sustains same perceived brightness and the same K value! This technique works in Adobe Illustrator & Photoshop CS6, CC, CC2014, CC2015, CS5, CS4 and CS3. MagicPicker is designed to be easily dockable and to fit automatically any kind of Photoshop or Illustrator environment. In any combination with other panels, like Layers, Brushes it will smartly take up your space. With quick access to all of its numerous controls and modes. 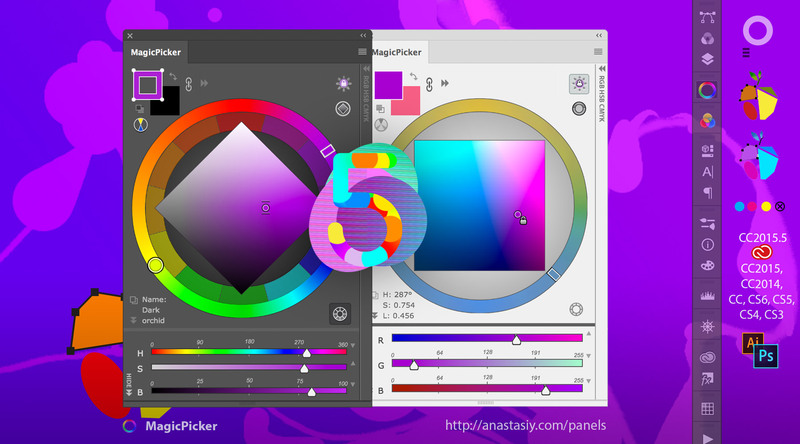 Use MagicPicker in horizontal or vertical layout inside your favorite Adobe software. Dock it to any part of the interface or leave as a standalone panel. Or even keep it incredibly small in Compact Mode if you’re a fan of ascetic UI configuration! MixColors 2.0 brings Color Swatch Groups, Cloud Sync, more! MixColors 2.0 finally delivers intuitive Swatch Groups, adds Cloud Sync, gets next-gen color mixing formula, brings full Adobe Photoshop CC2015 support and more! – Color groups. Reimagined! New simple and intuitive color group management with drag’n’drop support. – Sync colors and color groups with the Cloud – safe 256-bit encryption on the server side! Easy cloud handling. – Color mixing improved – next-gen color mixing formula for faster and more accurate results. – Adobe Photoshop CC 2015+ and CC 2014 support – MixColors has been rewritten from scratch to support new Adobe Creatve Cloud platform. – Color history is improved. – Small/large color swatches handling improved. – Tons of performance improvements on CS3, CS4, CS5, CS6 and CC platforms. – A lot of bug fixes and improvements by your feedback. Author AnastasiyPosted on January 27, 2016 Categories MixColors, News, UpdatesTags Adobe, Adobe Photoshop, art, cc2014, CC2015, Cloud, color blender, Color Groups, color mixer, creative cloud, Creative Suite, CS3, CS4, CS5, CS6, design, HSB, mix colors, photography, RYB, Swatches1 Comment on MixColors 2.0 brings Color Swatch Groups, Cloud Sync, more! With MagicPicker you can pick colors on the Traditional Color Wheel – a color wheel based on 12 basic colors used in traditional painting. That allows you to pick colors having relationship based on physical pigments of the paints. For example in this color scheme complement colors red is the opposite to green and yellow is opposite to purple. This color wheel is often referred to as Itten’s Color Wheel. Switch to this mode by clicking on the button to the right-bottom of the color wheel.